Every year I try something new when targeting panfish, specifically bluegills. I may try a larger jig, spider or some other type of lure to catch bigger panfish. Or I might try micro lures to entice these tasty treats. This year, I tried something new that was something old. A good friend of mine was telling me about catching a nice mess of bluegills using a simple float, hook and sinker. What he was putting on his hook was the secret to his success. All spring I’ve been using wax worms on my gnats and ice jigs and having good success but lately the fishing had seemed to slow a bit. After hearing about my friends success, I had to ask how he did it. His secret, which really is no secret, was red worms. He was going back to basics and catching some great bluegills. I went down to the local bait shop and picked up some red worms and hit the lake. I’ll admit it has been a long time since I’ve used a red worm to target panfish but I’m glad I did. The big gills went nuts over the big red worms. The one trick I learned was to start threading the worm on about ½” down from the head and leave about ¼” to ½” of the tail of the worm off of the end of the hook. This way you’ll have double the action from the worm wiggling around. The gills couldn’t resist the worms and it didn’t take long to catch a nice mess. My set up was simple, a Carlisle slip float, Arnold Speed Stop, a couple of sinkers and a simple hook fished on 4 pound test. 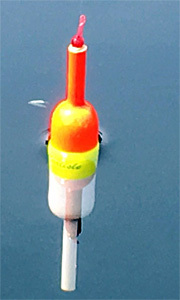 I had a couple of poles rigged up and would fish both at the same time, each at a different depth to locate the gills. Targeting weed edges seemed to be the trick. This time of year, you’ll find gills top to bottom but most of the gills came in 10′ of water fishing about halfway down. I would move along quickly until I found active gills. With the action of the red worm, if fish were in the area, you knew if fairly quickly. 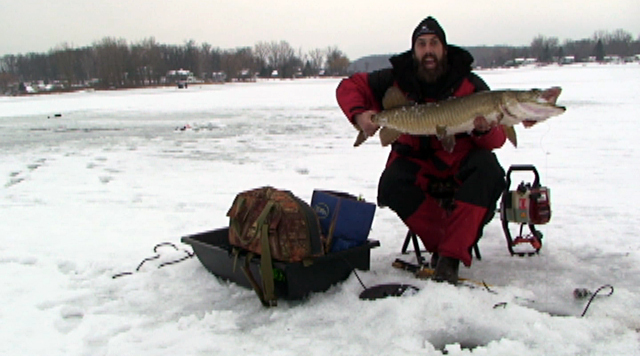 Next time you’re out targeting your favorite fish, think back to how you use to catch them. You might just find out that going back to the basics is a great way to go! Bluegill caught with a Carlisle slip bobber float rig. Bluegill caught on a slim Carlisle slip bobber rig.